Edited by: Gertrud Schneider-Blum. Series edited by: Wilhelm J.G. Möhlig. 12 pp. Roman, 102 pp. Alaaba is a Highland East Cushitic language spoken by about 200,000 first and second language speakers. The capital of their area, Alaaba Kuliito, is found 310 km south of Addis Ababa. Proverbs are used in all contexts: during quarrels between families or within a family, to comfort somebody who has a problem with a child or with a neighbour, to comment on misbehaviour or to stress the importance of one’s family. Advice or reproach, which would be considered impolite when administered in plain words, becomes acceptable when couched in proverbs. In using proverbs, the speaker does not impart his personal opinion but instead conveys an accepted wisdom, i.e. the result of many years of experience of the Alaaba forefathers. A proverb contains a genuine truth. Alaaba is a predominantly agglutinating language, but due to complex morphophonological processes, morphemes cannot always be clearly distinguished on the surface level. To make these distinctions more transparent, an additional morpheme break line is here inserted in between the Alaaba examples (continuous text in bold italics) and the interlinear glossings. The English translations (which follow the original Alaaba structure and at the same time attempt to be as free and idiomatic as possible in order to facilitate understanding) and – where necessary – an explanation of the meaning of the proverb and/or the circumstances under which the proverb might be used (given in brackets) are added. Alaaba is not a tone language, but accent plays a crucial role. The relevant rules are described by the author in detail in chapter 2.7 on Prosodic Features in A Grammar of Alaaba (see link below) and are not repeated here. In this book, pitch accent is marked by an acute accent and word-final devoiced vowels are bracketed to facilitate reading. For practical purposes, i.e. to easily find a certain proverb, they are sorted in alphabetical order. This small booklet of proverbs and sayings serves a number of purposes. It can be used as an additional textbook for those linguists who have read the grammar and who would like to consult further examples. But it is also of interest to those linguists who concentrate on literature, to be more specific, on the poetic aspects of language. Furthermore it gives an interesting insight into the culture of the Alaaba people. Though Ethiopia is rich in proverbs, even proverbs about proverbs (e.g. “A conversation without proverbs is like stew without salt” in Oromo), it is amazing how few Ethiopian languages have had their proverbs collected and published. Booksized collections of proverbs are only available for less than 10 of Ethiopia’s +80 languages. This one is a welcome addition, especially since it is from a lesser known community. 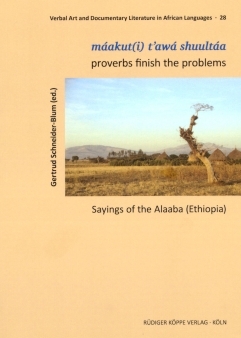 [...] This collection of proverbs is valuable as documentation of Alaaba culture and language, but also as a stimulus to other scholars to collect and publish proverbs in the proverb-rich languages of Ethiopia. The description of a language with little knowledge about is increasingly based on the analysis of empirical data collected by the describer. Today’s grammarians inductively elaborate analytic solution from the observation of rich repertoires of predominantly textual material. In order to record that largest possible variety of linguistic structures, these texts are varied in genres and topics. The result is that the descriptivist collects an amount of data that are not of exclusive linguistic interest, but contain extensive information of the speech community, their knowledge and their oral arts. This is the case of Gertrud Schneider-Blum’s research activities among the Alaaba of South Ethiopia. She conducted several weeks of fieldwork for the redaction of A Grammar of Alaaba, and she ended up possessing a fair amount of proverbs in this Highland East Cushitic language. Apparently, the greater effort of the author was to understand their meaning rather than to collect. [...] It is another fundamental piece of knowledge about Alaaba’s language and culture created by the world’s specialist on this domain. It should also be taken as an example for those linguists who want to contribute to the advancement od non-linguistic studies on the speech community they formerly worked or currently work with.